Over the bank holiday I dropped in to see how the clients for our low energy house are getting on. They've been in residence for a good few months now and it was great to see the house in operation as a home. The property is going to be open to visitors as part of the programme of tours arranged during September 2013 by West Bridgford Eco Houses- if you want to visit check out their blog post about the house. All the energy saving features are behaving well, although it is too early yet to get statistical feedback on performance. The basic principle is to make good use of passive solar gains from the south and trap the heat in the the high thermal mass of the building, inside a highly insulated jacket. 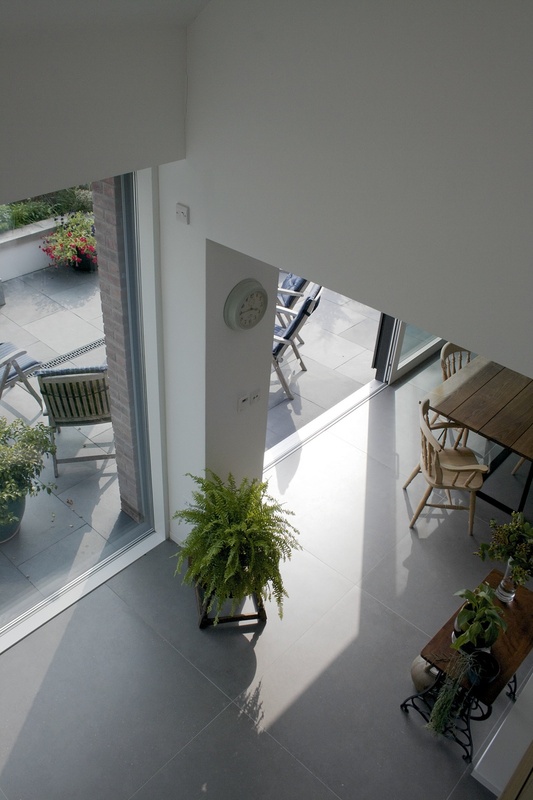 Overheating is prevented by the thermal mass, which evens out temperature highs and lows, and by effective use of shading on the south facing windows. The other important factor is to control drafts, and the build quality here is exceptionally good. The really gratifying thing to see was that the house is working well as a home for our clients- it's clearly a comfortable, welcoming and relaxed place to live. 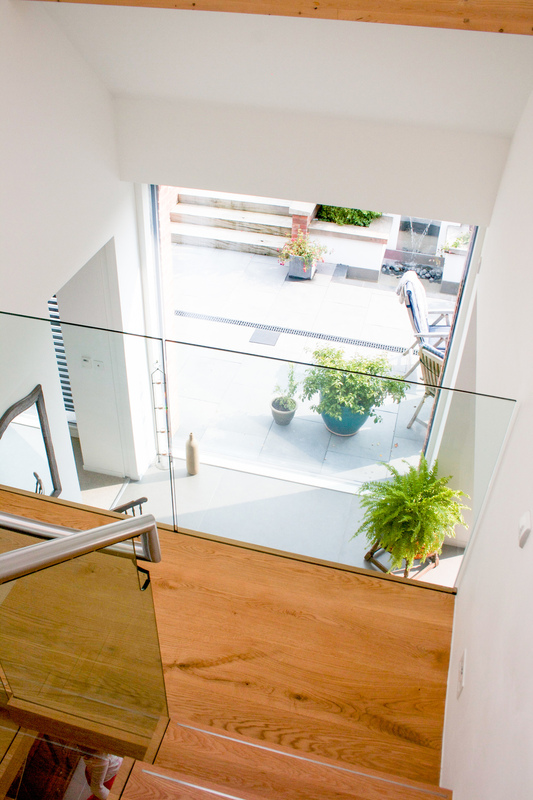 Finishes, glass balustrades, landscaping and installations are going in as the low energy house nears completion. Update: The building is finished and occupied. See our portfolio piece for the latest. 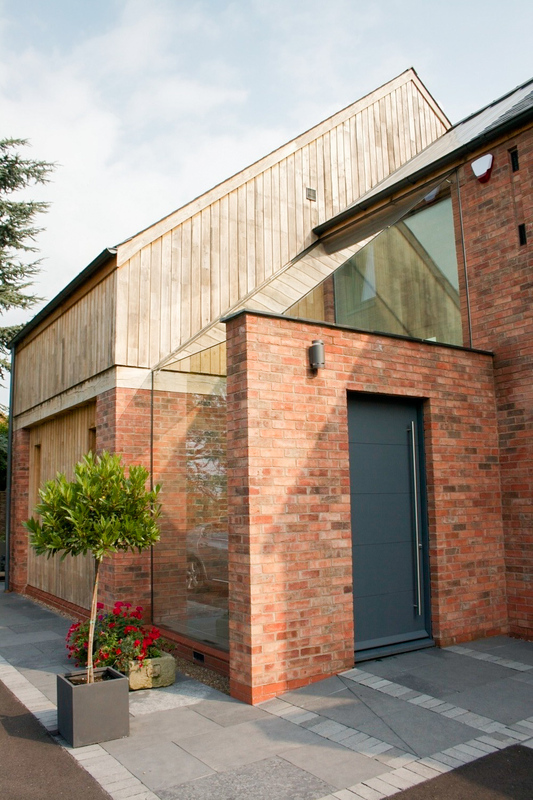 Replacing a 1980s bungalow on an infill site in a Nottinghamshire village, the design of this house had to complement the Conservation Area setting whilst achieving extremely high performance as a “zero carbon in use” eco-home. 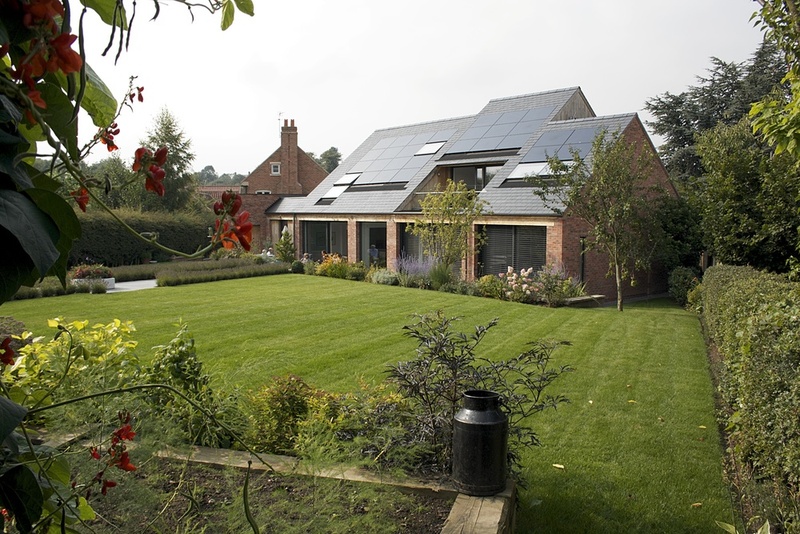 Designed using the PassivHaus Planning Package and executed in a palette of brick, oak, slate and zinc, the house includes a central frameless glazing porch and open stair, an integrated balcony and an extensive built-in photovoltaic array. 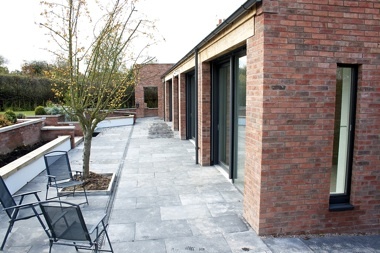 The south facade, designed to maximise winter solar gains while providing shading in summer, . Photovoltaic panels and rooflights are integrated into the slate roof. 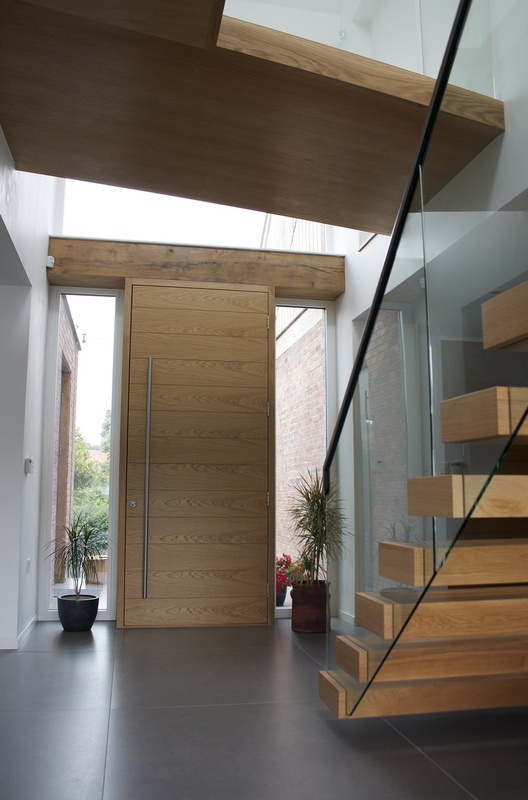 Our client required a contemporary home that could be built to achieve extremely high energy performance in use. Their site was carefully selected within a characterful village setting, approached from the main village street to the North and having a good southerly aspect for solar collection. Alongside the development of our client’s brief and requirements, we carried out a careful analysis of the village layout and the materials and massing of surrounding buildings. In a sensitive planning context the design was developed in close consultation with the local planners and community, documented through an in-depth Design and Access Statement. The delicate balance between achieving PassivHaus design targets and satisfying Conservation Area planning requirements meant that the design was evolved and presented in various contexts. A consultation on site in the existing bungalow saw a 20% turnout of the village giving unanimous support for the scheme. The design uses the north facade to address the village setting and large windows and solar roof to the south to maximise useful solar gain and collection. 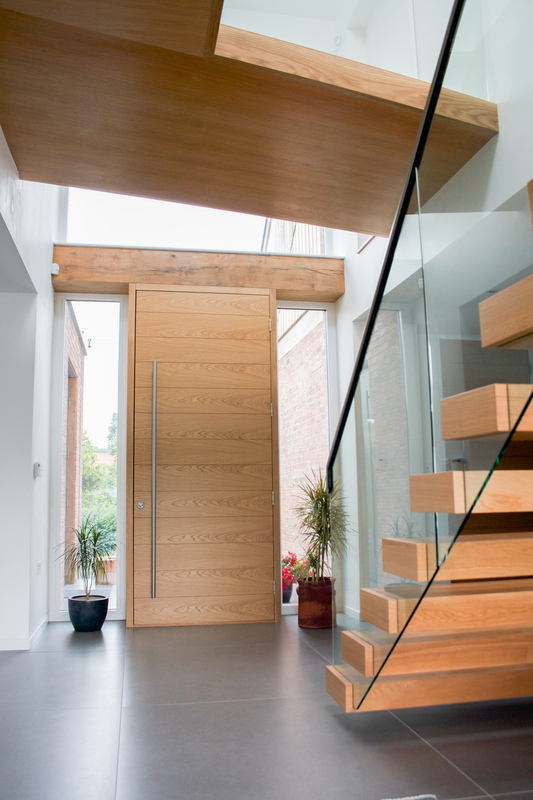 The requirement to reduce north facing glazing to meet PassivHaus design targets is offset by the provision of a frameless-glazed porch, which prevents the escape of warm air whilst providing an open welcome to visitors. The North facade and street front, a contemporary response to the surrounding buildings of the Conservation Area. The smaller windows and variegated massing on this side of the house respond to the scale of the village, whilst the private rear of the house presents a single expanse of roof for solar collection, free of any self-shading projections. An integrated system of flush-fitting photovoltaic panels and rooflights was selected to create a smoothly integrated roofscape. Excess heat gain is controlled by the use of integrated external louvre blinds to the large sliding glass doors on the south elevation. 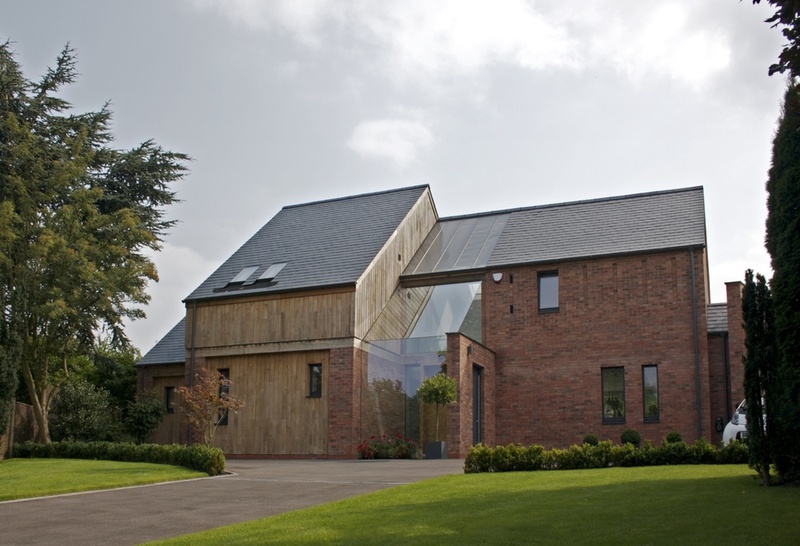 The integrity of the design is maintained by the simple palette of materials: red brick, oak cladding and beams, slate roofs. A small area of zinc roofing over the glazed porch expresses the articulation of the house plan around the double-height circulation zone. 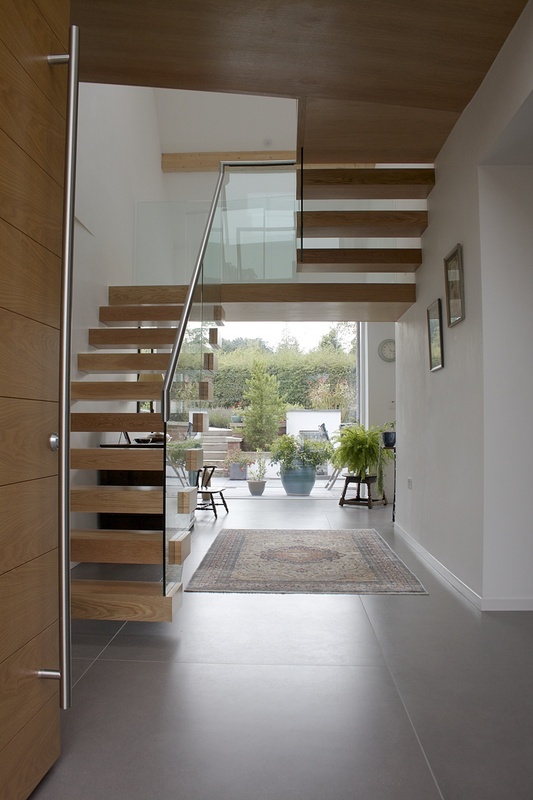 This project was shortlisted in the 2014 RIBA East Midlands Awards. Design overview (click to enlarge). 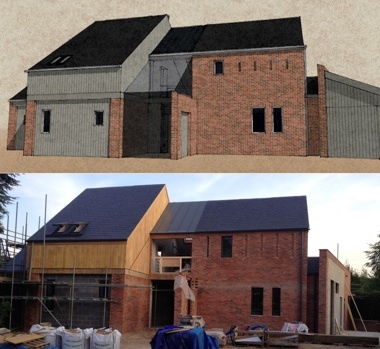 It's great to see our house design in a North Nottinghamshire village beginning to emerge, fully formed on site. The oak, brick, slate and zinc materials palette is looking good... But most of all, this project demonstrates that low energy housing can be built even in sensitive planning contexts. 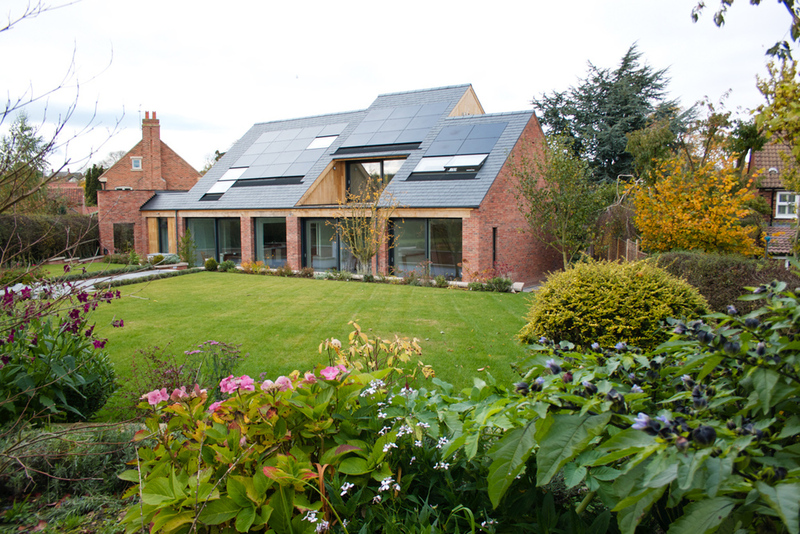 We designed the house, in its village conservation area setting, using the PassivHaus Planning Package, a method that uses tried-and-tested approaches to reducing energy use in buildings. Now the house is nearing completion under executive architects Parsons + Whittley and builder Nick Martin of Hockerton Housing Project fame — testament to a dedicated client and team. 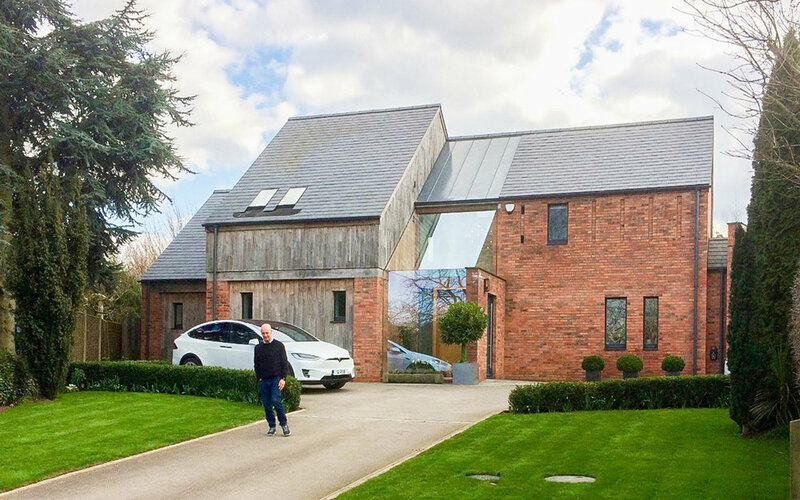 We're designing a new build house for a village in Nottinghamshire, using the PassivHaus Planning Package (PHPP) as a design tool. The site has an excellent orientation, allowing extensive use of passive and active solar collection to the rear of the property. The north, street-facing facade has been developed to respond sensitively to its Conservation Area setting. The project is currently going through consultation with the village residents and Local Authority planning department prior to the submission of a planning application.